Oregon media are twitterpatted over the school mascot issue. Too much hand-wringing, too late. Naming school sports teams Redskins, Indians, Braves and Chiefs has long been on the radar of American Indian activists: hardly a new issue. But in Oregon, where I live, news reporters have anxiously awaited legislative action to turn thumbs up or down on legislation that would ban Indian names for sports teams. This week the State Board of Education voted 5-1 to rid “Native American-themed mascots by 2017 or risk losing state funding” according to The Oregonian. The decision took 6 years and also prevents schools from using logomarks that refer to tribes. Oregon lags behind institutions that long ago changed their policies. For example, Dartmouth College ditched the Indian symbol in 1974. Stanford University dumped its Indian moniker in the 1970s. 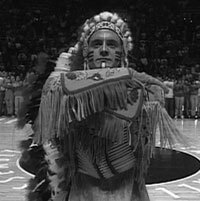 But the University of Illinois was recalcitrant, and it wasn’t until 2007 that the live Indian mascot faked his last war dance. An actor “played” an Indian “chief” at the University of Illinois athletic games, inventing ersatz songs and dances gleaned from old Westerns and Bugs Bunny cartoons. Charlene Teters (Spokane) took the mascot issue to heart, and challenged the university and sports teams to get rid of the foul-mouthed actor and Indian imagery. The award-winning documentary In Whose Honor (1997) chronicled Teters’ activism and became required viewing in my college classes. What a pity that Oregon is only now taking action on an issue that Dartmouth solved 38 years ago. This entry was posted in authenticity, ethics, framing, Indian, journalism and tagged Indigenous Science, literacy, rhetoric, stereotypes. Bookmark the permalink. Over the ensuing years, the use of these symbols at the University of Mississippi has caused considerable debate. On the one hand, they represented the state’s heritage and as such were a source of pride, inspiration, and unity among its citizens. The opposing position was that these symbols represented a history of oppression against African-Americans, noting that the Rebel flag was also a prominent symbol of the Ku Klux Klan. Opponents argued further that, since almost one-third of Mississippians are African-Americans, the flagship university of that state should not use symbols that recall the degradation and demeaning of their ancestors. Is it proper, they ask, to use the key symbol of the Confederacy and African-American enslavement as a rallying symbol for the University of Mississippi’s sports teams–teams composed of whites and blacks?